The Alcons Ribbon Calculator™ is Alcons’ line-array simulation and set-up tool, turning the Alcons line-arrays and line-source columns into a precision instrument. Instead of developing a proprietary tool, Alcons decided to commit to standardised simulation platform. 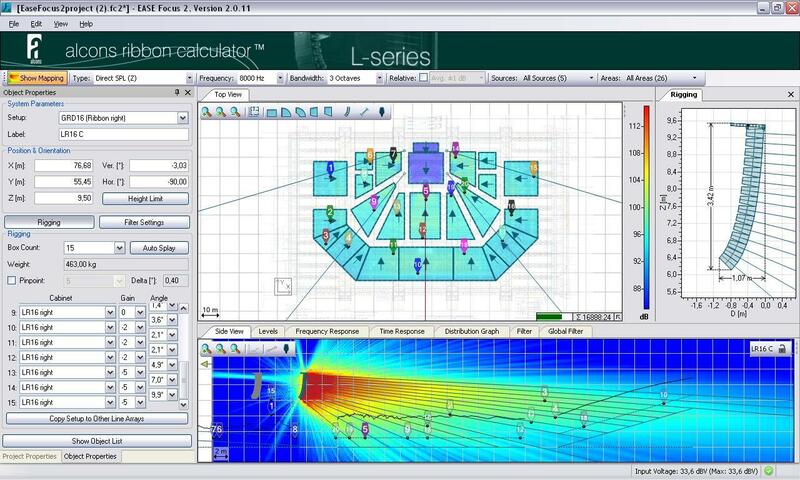 Not only to have optimised integration between line-array set-up tool and acoustical project simulations, but also to have a platform where users can compare different systems from different manufacturers. Download the GLL with simulation data for your system. This GLL contains the simulation data for the VR5 mini point-source monitor. This GLL contains the simulation data for the LR7 and LR7B micro line-array system. This GLL contains the simulation data for the LR14, LR14/90 and LR14B ultra-compact line-array system. This GLL contains the simulation data for the LR16 and LR16B compact line-array system. This GLL contains the simulation data for the LR18 and LB18 compact mid-size line-array system. This GLL contains the simulation data for the LR28/80, LR28/110 and LB28 larger-format line-array system. This GLL contains the simulation data for the QR24/80, QR24/110 and QM24 line-source columns. This GLL contains the simulation data for the QR18, QR36, QM18, QM36 and QB363 line-source columns. This GLL contains the simulation data for the RR12 point-source array in vertical line-array configuration. This GLL contains the simulation data for the RR12 point-source array in horizontal array configuration (1-6 units). This GLL contains the simulation data for the SR9 front-fill. This file contains the EASE simulation data for the TS3 monitor. This file contains the EASE simulation data for the TS7 monitor. The Alcons ARC3™ was developed in cooperation with Software Design Ahnert GmbH, the originators of the industry-standard EASE® electro-acoustic design a.o. The ARC3™ data files are compliant to the EASE® Focus v3 platform, as well as the EASE® program. The algorithms that drive the programs take into account the coupling principles of arrayed (line-) sources. ARC3™ is based on actual system measurement output data (up to 1-degree accuracy) and is designed to offer three-dimensional (horizontal + vertical) modelling of Alcons’ L-series pro-ribbon line-arrays, R-series point-source arrays (vertical-only) and Q-series pro-ribbon column-arrays. It is capable of multiple system modelling in one project simulation. Furthermore, the program enables simulation of cardioid low-frequency arrays of the B-series range of subwoofers. The GLL (generic loudspeaker library)-based simulation data contains all system configurations from the Sentinel amplified loudspeaker controller. Together with the Virtual Equalizer for system tuning in the simulation and the extended frequency plotting from 20 Hz to 20 kHz, ARC3™ offers even more advanced modelling, to turn the Alcons pro-ribbon line-array systems into a true precision tool. Mapping properties (full-colour SPL mapping, up-to-9 reference positions). The modular character of the 5 sections, enables a custom-tailored screen lay-out. Being a set-up tool, ARC3™ offersa relatively simple, intuitive modelling tool, while supplying the required prediction data for optimal system performance. It considers the direct-field response, leaving out any acoustical parameters; For in-depth analysis of system performance within a projected acoustical environment, it is recommended to use EASE® instead. EASE® is the worldwide standard for acoustic simulation for both inside rooms and open areas. Rooms can be defined using a CAD module, absorption coefficients can be assigned to surfaces, and sound sources as well as listener positions can easily be added to the true-3D model. With Alcons’ GLL in EASE®, the performance of an Alcons sound system in a suggested acoustical environment can be predicted with a very high degree of accuracy. The generated simulation includes reverberation times, speech intelligibility and other acoustical parameters even before the room itself is built. EASE® and AFMG® are registered trademarks of AFMG Technologies GmbH.